Yesterday, Xiaomi revealed the latest version of their custom Android ROM, the MIUI 9. The MIUI 9 is built on top of Android 7.1.1 Nougat and adds a number of new features to the already very feature rich ROM. According to Xiaomi, more than 2.8 billion devices around the world are running on the MIUI ROM. 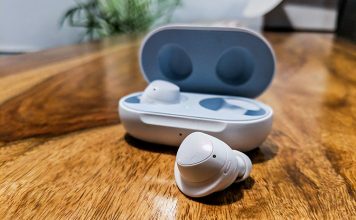 That is a lot of expectations, which Xiaomi will hope to meet with this new update. 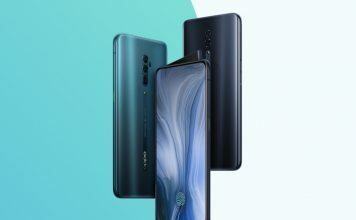 So, does Xiaomi deliver or falter? Note: The final version of the MIUI 9 update might cut or add new features. Also, we have tested out the China ROM of MIUI 9 and the Global ROM of MIUI 9 might not include a few of these features. The biggest feature of the MIUI 9 is probably the integration of a Smart Assistant. 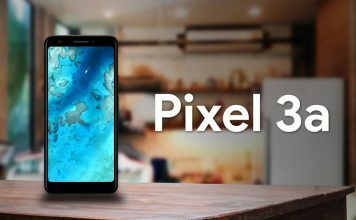 The Smart Assistant packs all the usual features which we have come to expect from a smart AI. You can search for photos, text messages, emails, notes, and the web among others. You can access the Smart Assistant by swiping left to right on the home screen. The panel also acts as a smart hub, giving you access to all your important information in one place. Think of it as the Google Now page. 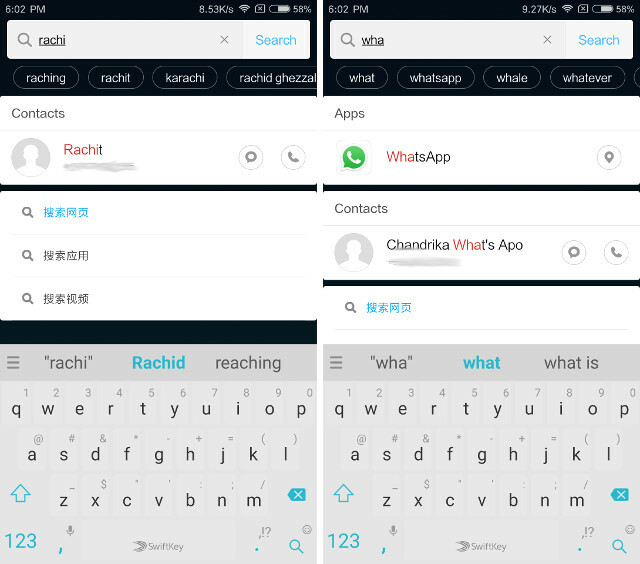 Plus, it features a universal search feature, which lets you search for almost anything on the device. It is a cool new addition but nothing different from what has already done by the likes of Google and Apple. 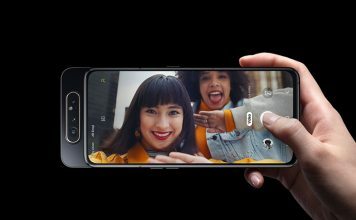 Only time will tell if the assistant becomes a hit or fails like Samsung’s Bixby. The Smart App Launcher aims to help you quickly switch between the apps based on the information on your screen. 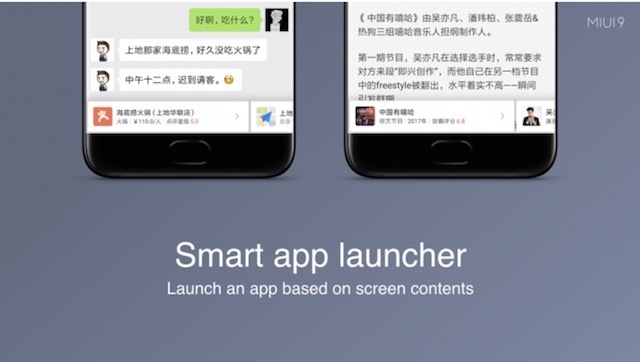 Suppose you are on an app and invoke the Smart App Launcher. The Launcher will read the information on your screen and will show you recommendations for apps which you may want to open. The idea here is that, you won’t have to go back to home screen and search for the app you need to open, rather, the Smart App Launcher will be smart enough to suggest you the app, thereby reducing your work. It will also show you some relevant information related to whatever it is on your screen. You can say, that it is a little bit like Google’s Now on Tap aka the Screen Search feature. However, the feature is said to be China exclusive feature, so we were not able to try it out on our Mi 6 or Redmi Note 4. As I mentioned earlier, this Smart App Launcher is still not working on my phone, but when it will, it is supposed to allow enhanced search options inside the gallery app. 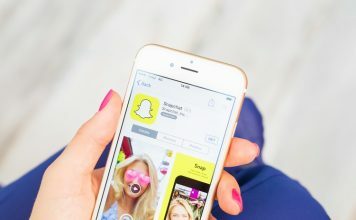 You will be able to search your photos library for people, locations, expressions, events, documents, screenshots, and more. 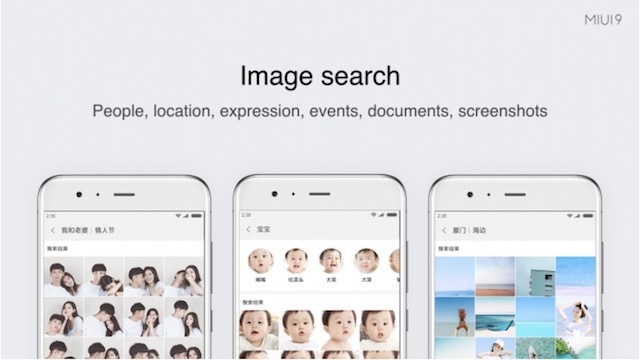 However, Google Photos already does that better than any other such service, let’s hope MIUI’s Image Search feature is equally good if not better. With MIUI 9, Xiaomi has focused a lot on the ROM’s optimisation. It is no secret that MIUI has always been heavy on resources. MIUI 9 is supposed to fix that. 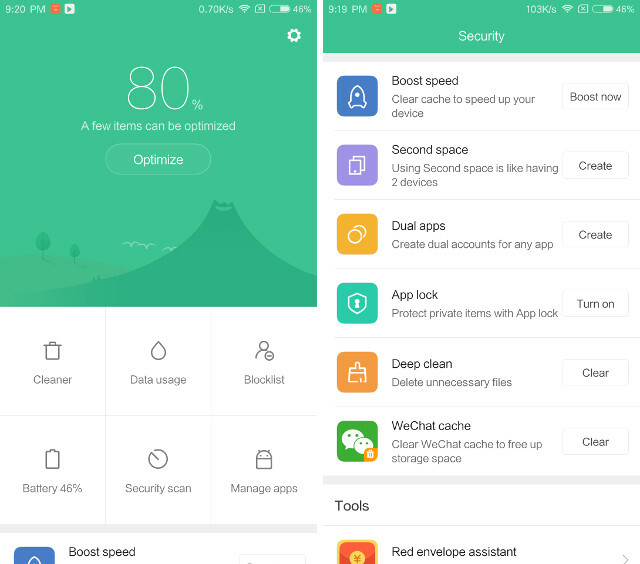 There are a number of under the hood changes which have been included to make the MIUI faster and more responsive. 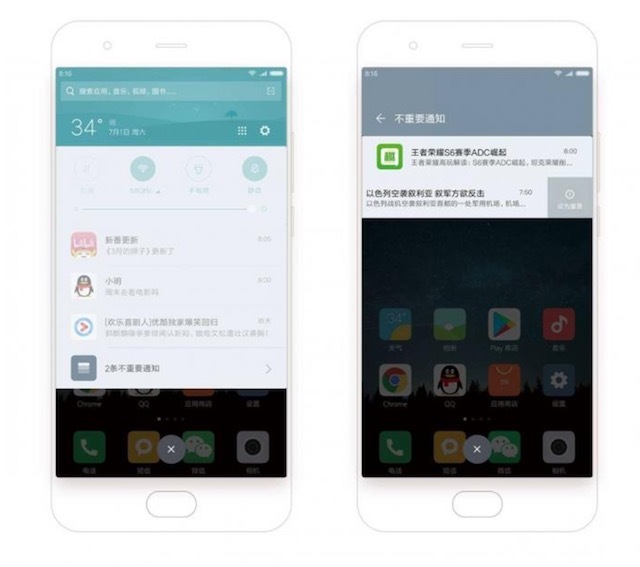 Since the MIUI 9 is based on Android 7.0, many of the enhancements feel similar to those brought by the Android version itself. There’s Dynamic Resource allocation which will deploy hardware resources to the apps depending on their importance. The app launch time is also supposed to decrease owing to the inbuilt Launch Acceleration. This feature will momentarily boost resources to the apps that are being launched, resulting in faster app launch. There’s also a new file system which is supposed to be faster. A lot has been done to reduce background processing power of the apps. This means that, now the apps in the background will not eat away most of the resources. 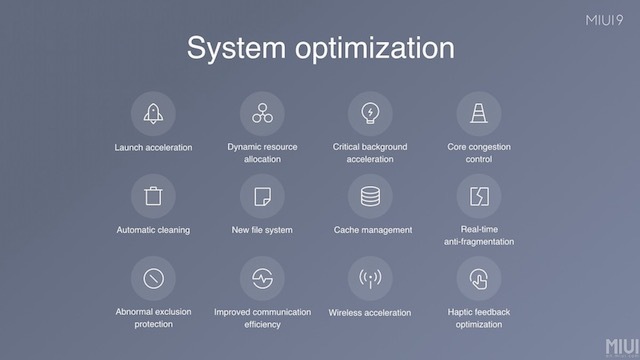 Other optimizations include automatic cleaning, cache management, and wireless acceleration among others. If everything goes as advertised, MIUI 9 will bring a much snappier performance than any of its predecessors. Even in the beta build, I have found this to be true to an extent, so the future is looking promising for MIUI users. MIUI 9 brings a lot of welcome changes in the way it handles notifications. Now, all the notifications for the same app are grouped together, like in stock Android. You can use a two-finger swipe gesture to reveal the notifications individually. There’s also Quick Reply, allowing you to reply to messages from the notification itself. You will no longer have to tap the notification to go the respective app, just to send a reply. Just swipe with two fingers, and you will see the option to send a reply. There’s also a new feature called Notification Filter. The feature allows you to group those notifications together, which you deemed to be unimportant for you. All those notifications will be grouped in a single notification and will be muted. Hence when you receive an unimportant notification, you will be not be disturbed. 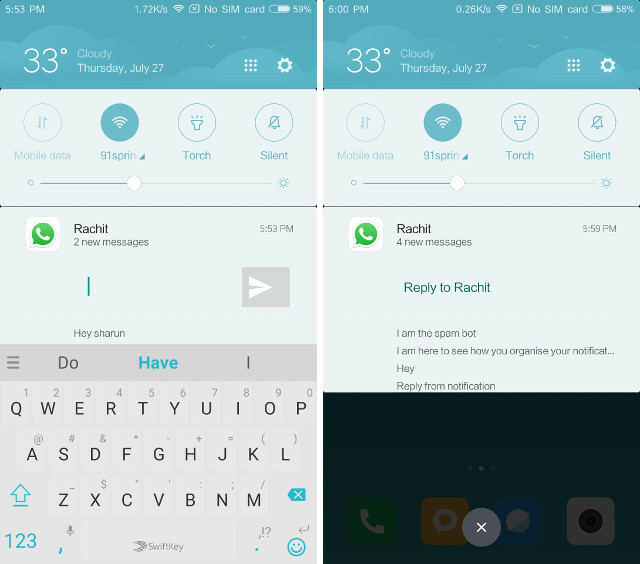 The grouping will also keep your notification shade clean. One of the areas which have received some major upgrades under the MIUI 9 is the home screen. One of the biggest visual as well as functional change on the home screen is the way we move multiple apps. Now, when you will select multiple apps to move them, you will see a representation of all the pages at the bottom of the screen. Basically making it easier for you to move the apps. Widgets panel also receives a much-needed facelift. Now the widgets get their own page with vertical scrolling, just like on Stock Android ROM. The settings panel now looks much more refined and easy to navigate. Everything looks minimalistic and elegant. In the settings panel, you get the option to lock a screen. Once you lock a screen, you will not be able to move the apps off that screen. When you tap on “More”, you will get the options to change your default launcher. 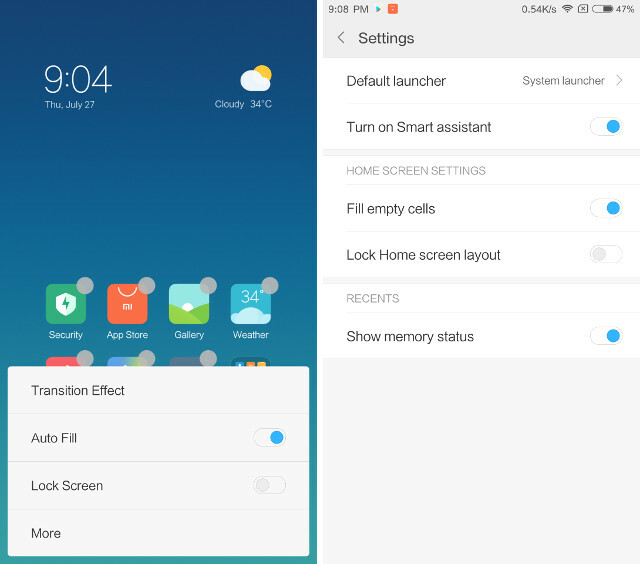 This is a welcome change, as previously, changing the default launcher used to be one of the most challenging tasks on the MIUI ROM. All in all, I think that the home screen is much more user-friendly and cleaner in the MIUI 9. At first look, the MIUI 9 lock screen looks similar to that present on the previous versions of the ROM, but you will be mistaken to think that. 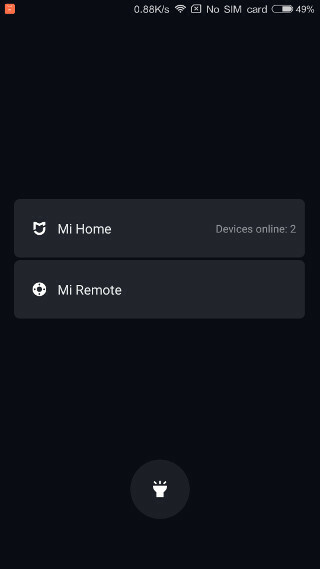 Just swipe from left to right on the lock screen, and you will find a new page showing you all the Xiaomi connected devices like Mi Home and Mi Remote. There’s also a flashlight icon which may come in handy in certain situations. The Security App present in the MIUI has always been one of my favourite things about MIUI. With the MIUI 9, the app becomes even better. Now, you get a lot more actions on the home page of the app itself. The actions include boost speed, Dual apps, Second space, and App lock among others. But the best change inside the Security app happens in the “Manage apps” sub menu. You can tap on that to reveal all your apps. The layout is now very clean and easy to read. Also, the most important information is displayed on the page itself, allowing you to see them at a glance. For more information, you can just tap on the app, and you can find each and every detail about that app. MIUI 9 also brings the long awaited multitasking feature. To start split-screen, tap on the Recent button and you will see the “SplitScreenMode” written at the top of your screen. Tap on it and then drag the app you want to use in the split screen mode. Once you select an app, the option to select the other app will come in the bottom half of the screen. One neat feature here, is that the apps that do not support split screen mode will show an overlay badge stating the same. Apart from system improvements which make the ROM super fast, the new animations introduced in MIUI 9 also make the ROM feel snappier. The animations are fluid and seamless. Even the app icons get their own opening and closing animations. Moving between different apps and navigating the app pages cannot be any smoother. You will have to install and use the ROM to truly understand what I talking about. For me personally, this enhancement is something which I cannot go back from. 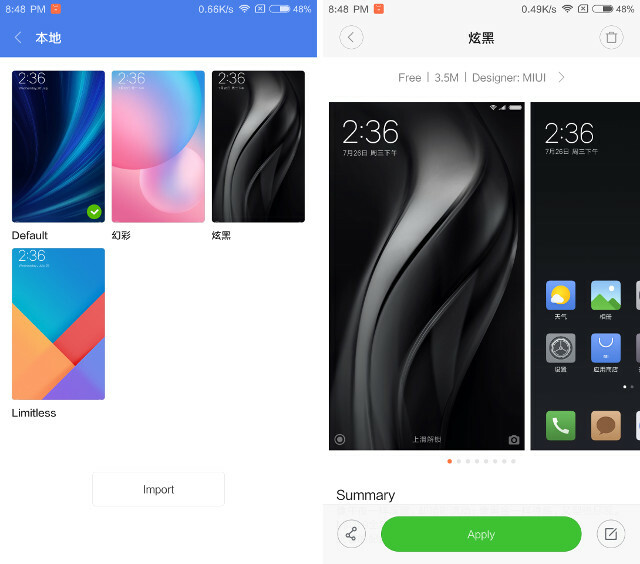 MIUI 9 introduces 3 new themes, No Boundary, Colour Fantasy, and, Cool Black, to go with the ROM. All of them are beautiful. I really love the dark Cool Black theme, which sports a dark background with slightly subdued app icons. Of course, you get the ever enlarging theme store where you can find themes for pretty much any look you will ever want. Still, it is great to see some custom themes coming from Xiaomi itself. Xiaomi is introducing a new feature with the MIUI 9 called the MIUI lab. 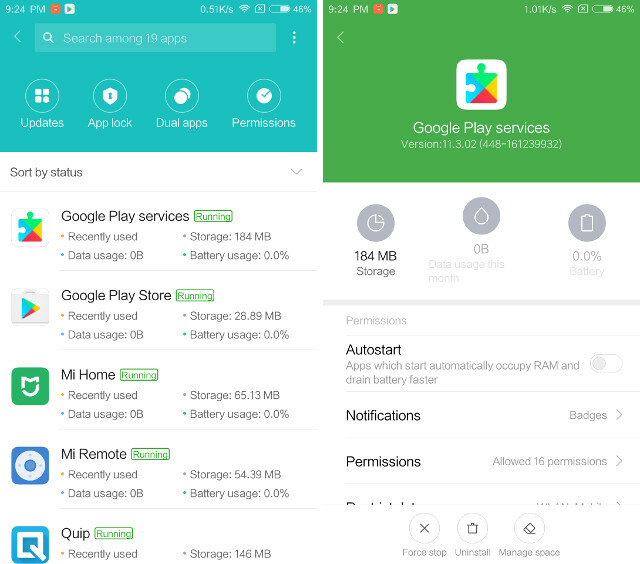 At the time of writing this article, there’s not much you can do inside the lab but in the future, the lab is suppose to hold the experimental features for MIUI, which users can test, if they want to. Frankly, I don’t have a clear understanding of this feature yet, but it is something to keep an eye on for the future. 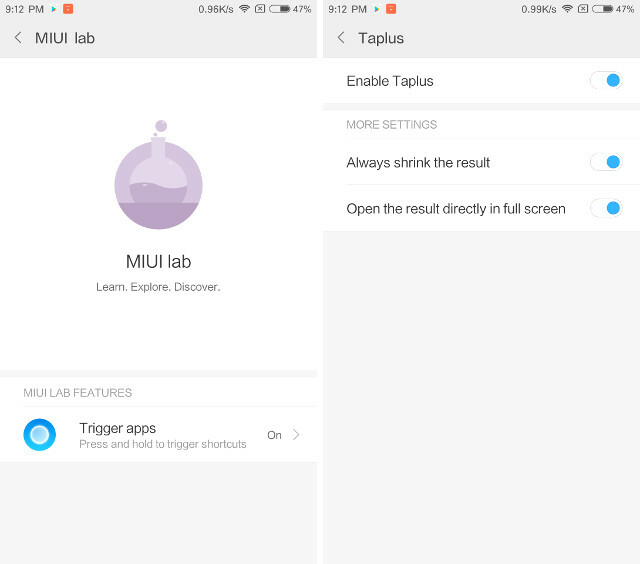 You can access the MIUI lab inside the main settings menu of your phone. 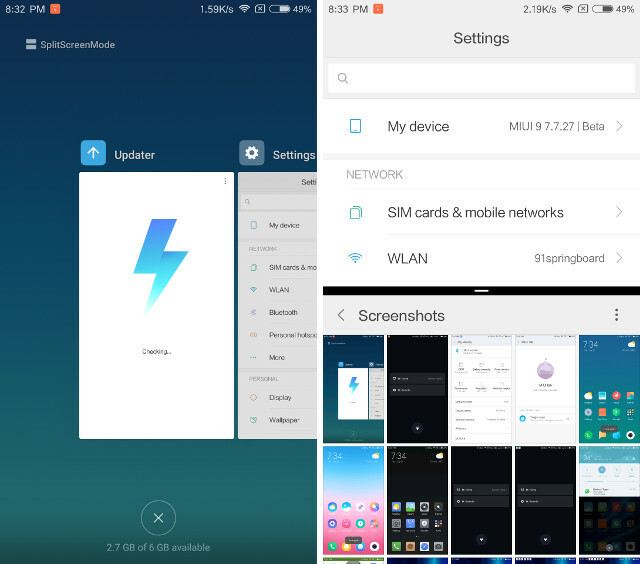 MIUI 9 Features: Good Enough or Not? Now that you all know the major features of the MIUI 9, tell us about your favourite ones in the comment section below. Also, share your thoughts about the MIUI 9. update Do you consider this as a worthy upgrade? 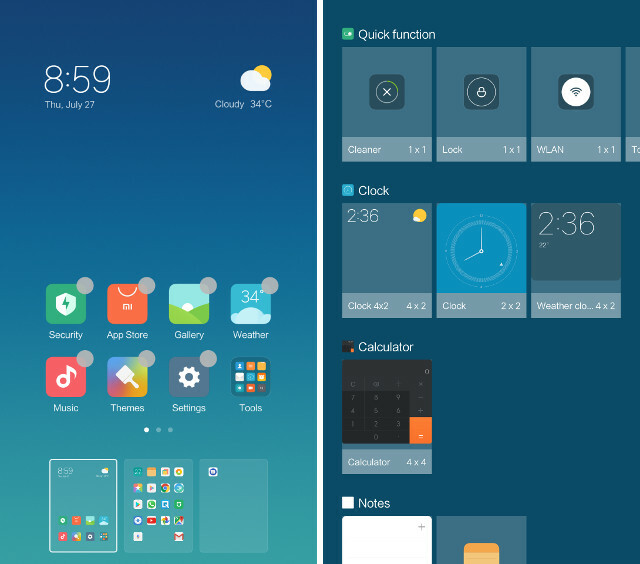 I think it’s a major improvement over the MIUI 8, but as always, I would love to hear your thoughts on the subject. Drop them down and let me know.